Thyroid, Parathyroid, Adrenal, Endocrine Surgery, How are hypoparathyroidism and hypocalcaemia treated? How are hypoparathyroidism and hypocalcaemia treated? Generally hypocalcaemia is treated with oral calcium and vitamin D keeping the blood calcium levels within the normal range and preventing the development of symptoms.Calcium carbonate is the cheapest form of oral calcium. Calcium citrate is more expensive but its absorption is not affected by lack of gastric acidity (achlorhydria), a common problem in the elderly.We suggest that if calcium carbonate is used it is always taken with food. Patients who are on proton pump inhibitors should most likely take calcium citrate and not calcium carbonate.Specifically in hypoparathyroidism, the ideal form of vitamin D drug is calcitriol (1.25-dihydroxyvitamin D) as the kidney cannot efficiently process other forms when parathyroid hormone (PTH) levels are low. In rare emergency circumstances, calcium can be given intravenously. It is essential that the calcium is infused through a large central IV line. On occasions calcium may leak through a vein (extravasate). 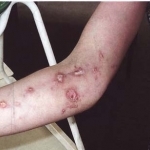 If this happens when calcium is given by an arm IV line it may cause irritation and necrosis of muscle and nerves (calciphylaxis). In neglected cases this can cause gangrene of a limb.